Another wonderful book by Rainbow Rowell, who still holds the title for my favourite author! Now I know some of you are probably thinking... 4/5 Jamie?? But yes, 4/5, I desperately wanted this to be a 5/5 book for me, however I think I may have hyped myself up too much, and in comparison to Rainbow's other books this one just wasn't quite as good. However, it was still wonderful and I loved it. I had some issues with the characters, mainly with Neal. He was a horribly unlikeable character and to be honest I couldn't see why Georgie wanted to be with him. I know, I know, you can't help who you love, but come on... he sucked! I have to admit that I loved Seth, he reminded me so much of my best friends. This book would be very relatable to anyone who is married and having some struggles. I couldn't relate directly with the situation between Georgie and Neal however, I've experienced similar situations. I found that the most relatable relationship in the book was between Georgie and Seth, thats mainly because my best friends are guys! I also enjoyed the magical yellow landline and all of the Harry Potter references, I thought it was such a nice touch and added something different to the over all feel of the book. I think I was also a little thrown off that this book was set during Christmas time and I wasn't expecting that at all, I think it would be a fantastic read during December! 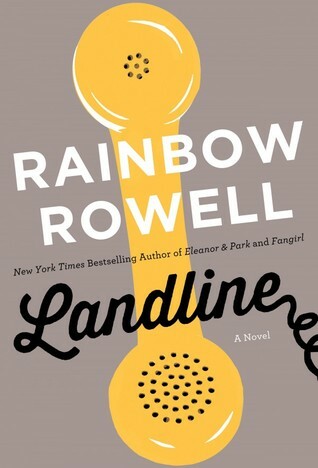 If you are a fan of Rainbow Rowell's writing than do not pass this book up! Its different from her others, but still very enjoyable! I of course recommend this book! A magic phone????? GIVE ME!!!!! I will have to check this out! I read Eleanor and Park and have heard raves about her other books, but I hadn't heard of this one! Rainbow is my FAV author! I just love all of her books!! I really want to read this book. I loved Fangirl and Eleonor&Park.